Then Emily, who was on the computer, said, "Hey, Mom, why don't you go on Facebook as soon as you get 300,000 hits on Life in the Shoe?" "Ok," I said, much like Jephthah must have said when someone suggested he sacrifice whatever comes out to meet him when he comes home. So we came back from our wild two days in DC and I checked my blog, and to my surprise it was at 300,298 hits. Ok. Facebook coming soon, like when I'm on my own computer again. How to summarize two wild days in the nation's capital? First of all, who would have thought that everyone else within a 200-mile radius also had the bright idea to put the family and in-laws in the van and go see the Museum of American History? Everything was crowded, busy, full, loud, and full of people people people. Of course the monuments were accessible and moving. The Korean War Memorial, with all those wet, battle-weary men stumbling uphill, guys the age of Matt and my nephew Jason. And the new WWII memorial, which is simple yet profound and very beautiful, and it's too bad it didn't get built until so many years after the war. You know, you don't realize from pictures in high school textbooks how huge these places are. Like the Jefferson Memorial always looked like an oversized gazebo in someone's backyard and in reality it is enormous, with tall columns and lots of marble steps and rounded stone platform things out the back where you can sit and soak up some sun on a very cold day. Unlike the open-air monuments, the museums were unbelievably full. We gave up on the Museum of American History, when the line snaked down the long flights of steps and far down the sidewalk, and they were letting in only a handful of people, every 20 minutes. We tried the National Archives and the story was similar. However, we did see the wonderful displays at the Conservatory and also the Air and Space Museum and a few others. And we toured the Capitol, a very very different proposition from ten years ago when we wandered all around the tunnelly things on the outside and saw Newt Gingrich get whisked into his black Suburban and then we went up the steps and the security guy chuckled at Matt's big pocketknife and handed it to Aunt Rosie for safe keeping and we were free to wander at will. No no. No more. Way out on the back lawn of the Capitol we descended some steps and waited in line while a uniformed guy told us to put all water bottles in the garbage, all food, all lotion, all perfume, all drinks, all sprays of any kind. Well. I had in my purse a dainty little tub of a new hand lotion that my fine neighbor Anita had given me for Christmas. I was not about to consign it to the garbage. So I rested a while on the little stone curb thing by the flower beds along the stairway. Hmmm hmmm, la di da.....and I reached back and gently dug out some dirt near the edge, quickly inserted my lotion and hand sanitizer, covered them with dirt and leaves, noted the spot, and casually took my place in line. Surely security was watching all these things, surely the city was alive with a thousand spies before the inauguration. Would I be found out, or not? We took the tour, a very tightly-controlled experience compared to ten years ago, but still interesting. The capitol is an amazing building and that is the truth. Then we went back outside and I rushed to my flower bed. . . hmmm, right there I think....Yes! there they were, safe and sound. Maybe the FBI had more important things to check up on, with the inauguration and all. Oh, we also saw the Lincoln Memorial and decided he doesn't really look like he's smiling on one side and frowning on the other. And of course one of my sons, that one that crashes into church beams, had to sit on the banister and go sliding way way down, in sight of three security guards and a sign that said, "Do not slide on banisters." We pointed it out to him. "Oops," he said. Jason: Ask me if I'm a red truck. Emily: Are you a red truck? and she loves to watch football games on TV. with piles of awesome food. "Our coats are no-nonsense. That is the only thing that makes sense to us." Today, the Lord willing, we all go to Portland by various routes. Tomorrow morning, the Lord willing, we all 8 fly to Virginia to my fine sister's for a week. Then Amy catches a ride to Bible school from there, and Emily stays an extra week for some aunt time. The weather and road conditions these last couple of weeks compel me to say "the Lord willing" more than normal. Hansie and Michael the neighbor will be taking care of things here. I wish all of you a memorable Christmas, full of joy unspeakable, the peace that passes all understanding, faith--the evidence of things hoped for, and love--the greatest of these. P.S. Oh my. That was the longest drive to Portland ever. 4 hours. Lots of packed icy snow in odd bumpy lines in the lanes, and a few extra bad spots made traffic back up for miles and miles. Let's hope the plane leaves tomorrow. Which is the more academically taxing? Which has a more intense social life? How hard is it to be alone at either (for introverts who have to have time away from people)? Which would have a more supportive atmosphere for someone in recovery? Miss Amy: Sit down and be quiet! Drennan: I'm not very good at multi-tasking. So what should you do if you happen to know that quite a lot of youth are living private lives which might just slightly shock the elders in their church? Not to say that none of the youth are wonderful and all. I'd really like to hear from young people in particular on this. What is cause for alarm? What isn't? How can older people intervene effectively? I realize we all have different standards of what is alarming. I spoke at a church recently where they had just been made aware that the young people were smoking pot in the parking lot during church services. And then on the other end of the pendulum swing we have the example that made my kids hoot with laughter the other morning: that when I was their age we were supposed to part our hair exactly down the middle and if we wanted to be a little bit cool and rebellious we would part it ever so slightly on the side, like half an inch. And in between we have my niece who is in on troubling information about what her seemingly straitlaced friends are actually doing while their parents and the church are oblivious because they look so good during daylight hours. But hey, from hair to pot, it's all about where your heart is at. So, young people and young at heart, I want to hear from you about this. Answer the specific question or ramble, I don't care. "Most of the time big women are, like, comforting, and skinny women are, like, grouchy. [pause] No offense, Jenny. Or Emily." Last night was the annual Christmas program at our church school. As always, everyone showed up starched and shined. They sang their hearts out and astonished all of us with their performance of "He Gave Everything," a drama that had us laughing at times and crying at others. Well, Rita Baker, she of the soft heart and five boys, cried. I don't know that the rest of us did. By what combination of skill and luck and sheer magic Miss Amy pulled believable, authentic performances out of teenaged guys, we will never know. All I know is that she had 15-year-olds, a species known for mumbling and scoffing and shuffling, up there enunciating clearly and taking on their characters like they meant it. As the principal's wife and the teacher's mom, I played my usual role of sending my frozen Christmas turkey to school and seeing it get schlepped around onstage, scavenging at the last minute for a flashlight for Paul the lighting guy, and arranging dozens of plates of food afterwards, a Mennonite Christmas-program feast at its best. Unfortunately, a few teenaged boys, no doubt tired of being trussed up in white shirts and dress pants, relieved that the program was over, and fueled by a few too many pieces of Aunt Bonnie's famous fudge, decided to go into the sanctuary and run around the perimeter. . . with the lights off. Now there are these thick beams that go up the walls in the sanctuary and arch up like they're holding up the roof. And you know what's coming, don't you? One of the boys--that would be mine of course--crashed into a beam. 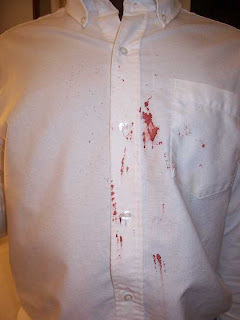 I was shortly summoned to the boys' restroom, where I got to see my nice calm son with a chunk of flesh dangling from his upper lip, with lots of blood all around. His tooth had gone right through his lip and ripped off a pea-sized piece; amazingly, the teeth are fine. We took him home and gently fitted the chunk back where it came from and held it there with a band-aid. Today he went to school and my nurse friend Sharon came and looked at it and said we did the right thing, and they seldom stitch up things like this so there's no need for a doctor unless it gets infected or something. Today, I am fine again. The son is also fine, except he's having a little trouble with eating and drinking, especially since his mouth was still sore from when he stuck a lighted match in it a few days before, showing off of course, and miscalculated the temperature and direction just a bit. "Mom, we weren't running; we were jogging." Sunday night it started snowing and blowing; by Monday morning the temperature was down in the low twenties, setting a new record, and there were little drifts of snow along the hedge and in the ditches. This simply does not happen in the Willamette Valley. It actually wasn't that much snow, maybe an inch. Ben came in from getting the newspaper, all astonished. "It's so weird! Some places on the sidewalk there's no snow, and then some places there's several inches!" I thought, how can a child who was born in Canada be so ignorant about the effect of wind on powdery snow? The weather basically shut everything down. There were lots of accidents in the area, and a lot more further north toward Portland, where the roads were much worse. Paul was across the mountain so we had lots of calls back and forth and to various ones already out on the road regarding should we have school or not. Those who grew up in colder climes generally said it wouldn't be a problem to drive to school; the natives weren't interested in going anywhere. But the kids really needed to practice for the program, so we started school at 11:00, and I drove the school van in, all my Minnesotan instincts coming into play because the roads were not nice at all--packed snow here and ice there and lots of places where you couldn't tell what was underneath you. I left the children at school and came home and called my mom just to chat. You may recall that Mom and Dad still live in Minnesota, and Mom is 88 and Dad 92. "It's 17 below this morning," Mom said cheerfully. "But we're staying nice and warm. Yesterday it was really blowing snow and ice, so we had to really be careful driving to church." I think my mom would have driven that school van without a second thought. "It was so nice this week. I even went out and washed the car. And Dad spent the last two days out in the barn fixing up his rabbit hutches. [chuckle] He has a new business--raising rabbits!" Sunday night. Children in bed. Paul over the mountain with Emily. Peyton the cat safely in back hall. And outside it is snowing and blowing. Yes, here in the Willamette Valley, it is blowing snow like it's Minnesota. Amazing. And I got the bright idea to sign up for YouTube (yes, YouTube; yes, me) and upload (wait, this is as bad as jumper cables--uploading is when it goes from my computer out the wire and into the plug in the wall and down the road and off somewhere else, right?) 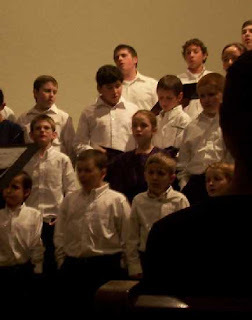 the little video Amy took of the Joyful Noise concert and Ben's solo, the one that makes me feel like my children have been freed from the curse of their mother's unmusicality. It is now 11:14 and this has been going on since 10:41 so I have a sneaking suspicion something is going wrong but meanwhile I'll post again while I wait. How can two people have such different reactions to the same person? So there's a certain person who I obviously will not name who sets my teeth on edge and has for years, but they don't know it. I feel this way for good reason of course, like how they treat people, tsk tsk, and that attitude. And then one of my beautiful daughters meets this same person, and Hits It Off, and they laugh and joke over lunch like old friends. Today I again taught the youth girls' Sunday school class. First they practiced a song with the youth guys, for the program, and sounded wonderful, and I thought to myself what a marvelous bunch of youth we have. And then we had our class, and I once again was amazed at this bunch of girls and how much potential is around this table and do they realize how they can go out and change the world. On the way home from church we got to talking about the people, both in the church and vaguely connected to it, who buttonhole us now and then to tell how they are deeply concerned about our youth group, usually in very vague terms and shaken heads and ominous insinuations, mmm-mmm-mmm, these young people, and did you hear so-and-so got a call from a minister from another church wondering what is with our youth, and we should all be deeply concerned. Me: So what's with that? How can we have two such different views of the same people? Or do I just as always not know what's going on? Amy: Maybe older people just always feel that way about younger people. Amy: I don't understand it. Me: I think we have an amazing bunch of young people. They talk, they get involved, they're really seeking God, they care about people... And they think! Amy: Maybe that's the trouble. Ok, let me scramble to say I am not trying to minimize legitimate concerns, in case any of the concerned are reading this. I certainly don't know everything that goes on and no doubt might be more worried if I did. I just know these girls are a sight more insightful and mature than I was at 18, and they challenge me, and encourage me, and I am honored to know them. And if they need a little extra grace extended to them now and then, well, don't we all need grace from our elders when we're 18. And when we're 46. AAAAAAAAhhhhh! I think the video actually uploaded! (Downloaded??) Ok, let's try it. Click here. Ben sings the solo. Steven is two guys to the left of Ben. Once upon a time, Paul's aunt Nadine married a black guy from Cleveland and gave birth to Chris and Cathy, both of whom are smart and ambitious high achievers who make their Oregon cousins look like, well, like seldom-seen, nice, slightly backward cousins from Oregon. I think Cathy is now a psychiatrist. Chris graduated from Princeton and was president of the alumni association, and so sat on the platform with the likes of Steve Forbes at graduations, and then he caught the Internet wave and with a friend or two started a company called Cyveillance that blossomed into something huge, and then he got out of that and is now a consultant or something in Washington DC or somewhere. I've kind of lost track. We always figured he would be the first mixed-race President and in fact Barack Obama reminds me of Chris in a lot of ways. There was something that always mystified me about those cousins. A lot of noise was made about them being such high-achieving young black people, and the fine example they set, and so on, based on the newspaper clippings that came around the Smucker aunts' circle letters. And I would think, yoo-hoo, hellooo, they're half black. What about the other half that's getting completely ignored here, this white, red-hair-and-freckles, mashed-potatoes-and-roast-beef, proper Mennonite half of their heritage, sitting anonymously out here in Oregon?? I once asked Chris about this at a family reunion. He sat there with his grandpa Orval's nose, and the ubiquitous Smucker freckles, of all things, and talked about his racial identity. He tended to take on the "black" label, he said, because that's how everyone saw him and treated him accordingly. No one looking at him would ever say, oh, I'll bet he comes from good Mennonite stock and his grandpa raises grass seed in Oregon. Which is not to say that he doesn't appreciate that side of his family, because he does. We emailed Chris for advice when we adopted Steven. Are we nuts, we said, to bring an African child into this setting. Chris said no. "If anyone can do this successfully, the Smuckers can," he said. All of which brings me to an interesting article I read today about Barack Obama and race. I was surprised how many parallels there were to Chris. Debate over whether to call this son of a white Kansan and a black Kenyan biracial, African-American, mixed-race, half-and-half, multiracial — or, in Obama's own words, a "mutt" — has reached a crescendo since Obama's election shattered assumptions about race. Obama has said, "I identify as African-American — that's how I'm treated and that's how I'm viewed. I'm proud of it." In other words, the world gave Obama no choice but to be black, and he was happy to oblige. Me: It's a brand name for chairs and suitcases and stuff that are supposed to be really strong. Steven: Oh, I thought it would be like 'Mennonite'. . . .'Samsonite'. . . I posted about seeing Bob Welch. And he posted about me. All unbeknownst to each other. I sat next to Bob Welch at the Eugene Library's Authors and Artists Night last week. Bob and his wife have two boys and now they also have two grandchildren, the younger of which is a girl. "Girls are just so. . . .different. . . from boys," Bob said. He and his boys are all the sort who bond by playing football and tackling each other, so having a delicate little girl in the family has been a whole new thing. He has learned to be more gentle and cuddly with her. I told him I am happy for his wife, who must have felt very overwhelmed with all the males around her all those years. It got me to thinking how very blessed I am to have daughters. Three of them, enough for lots of variety and fun and endless fascinating turns in the plot. And it seems that with almost anything I enjoy, I have a daughter who shares my tastes--tea, fancy coffees, knitting, cool old movies, quirky humor. I could also go into how sweet and nice they are, and how cute, and talented, but I would soon embarrass them. But I will say this--they are all good writers and will no doubt far outshine their mother before too much time passes. Amy doesn't post often on her Xanga but when she does, it's a treat, like this essay about her car that made me laugh the whole way through. She sounded surprised. "I wasn't trying to be funny." Well, sometimes if you just tell it like it is, it's funnier. Emily, as I told you, is writing a book about the last year. And she just reached another milestone in her recovery. I feel really bad about this, but it didn't even register what was happening and how important this was, and I was sitting right beside her. Sometimes you're too close to the situation to really notice things. And Jenny has sign-in lock on her Xanga so I will cut and paste a paragraph that amused me. "I hate it when I have a tickle in my nose. Like it feels like it's gonna sneeze, but it doesn't sneeze. If you ask me, it's very weird. I get it when I'm drinking pop." "I have a sister named Emily. And she didn't do any crime." Well, most of the time my girls are sweet and nice. And I am very fortunate to be their mom. I am not a gadget person. My mother-in-law, on the other hand, loves to give me the latest in egg slicers and stainless steel upright spoon holders. Which is fine, but I am the sort that is happy with a sharp knife that I got at the dollar store years ago, and I use it until the wooden handle breaks, and then I tape it together and keep using it. But today I got a cool new gadget I am very excited about. Before we go there, a confession: I have never learned how to use jumper cables. Crazy, yes, seeing as how I grew up in Minnesota and spent 8 years in Northwestern Ontario in Canada, both places where the winters get so bitterly cold that the little hairs in your nose get frosty and the ice on the lakes gets so thick you can drive on it. And where every self-respecting car has a little cord hanging out the front, and so when you get home from work you pull on the thick gloves and wrap the scarf around your mouth and nose, and then you wade through the snow and kick around until you find the stiff, frozen extension cord under the snow, and then you plug in your car and go inside knowing that all will be well when you go to start it the next morning. But sometimes you are parked somewhere else, like a church or mall parking lot, and you come out and turn the key while your breath fogs up the inside of the windshield and your teeth chatter, and all that greets you is a feeble rrrrnnnn rrrrnnn and then silence. Or sometimes, even when it's not winter, you leave your lights on and the same thing happens, like that one time I had left the car in long-term parking at the Portland airport and was left stranded at midnight. And then you need to use jumper cables. Would you believe I have always always been so blessed, not only to be rescued, but by someone who knew what they were doing? Always, the other person, usually a burly hairy lumberjack type with a pickup truck, pulled up to help me and calmly attached the cables while his breath whooshed away in clouds and his moustache turned frosty, and soon had me on my way. This is what I can never remember--is it positive to positive or positive to negative? My dad tried to teach me this, my brothers, my landlord, my friends, my husband, and to this day I cannot remember. And the story is if you get it wrong you'll have sparks and battery acid spewing in all directions. Or something. For the last ten years I haven't had to deal with cold killing my car battery but I have had to deal with a little bare-bones Honda that is wonderful in many ways but has no warning system when you leave the lights on. The last time I did this was out at Emily's and I would have been sunk if our friends Ted and Mary hadn't been in the area. Ted pulled his truck up like a good bearded Minnesotan and attached the cables and rescued me. And once again I didn't have to do anything except turn the key when I was told and act grateful, which wasn't hard. But now, at last, I'm all prepared for the day when my battery dies and the other party is a scatterbrained female who doesn't know how to use jumper cables either. Paul's Aunt Susie sells Avon products, and the girls and I like to sniff through the catalog now and then. Well, the last one offered, of all things, a charger that consists of a long wire and a plug on each end that plugs into the cigarette lighters. That's it. Aunt Susie brought it over today. It looks wonderfully simple but capable. And unlike most electrical, masculine gadgets, it has directions written for people like me. One plug says: "Dead battery." The other plug says, "Good battery." The directions are so easy they fit on one small paper and there are only 5 steps. Step 4: "Start the vehicle with the good battery, and leave it running while it charges the dead battery." See? Isn't that amazing? I am really tempted to leave the Honda lights on for a while tomorrow to see if this thing actually works. "It took me years to figure out that Skin-So-Soft wasn't some cleaning solution." "Ugly packages can have lovely jewels inside"
Ok, time for my annual attempt at being a salesperson. My books, those two over in the sidebar, make a great Christmas present for the moms/aunts/grandmas/wives/sentimental people in your life. You can click on the links and order them. Or you can get signed copies from me. And from now to December 15, they'll be $8 each instead of $10. If you pick them up at my house, postage is free. If you don't, it's $2 per book. You can mail me a check at 31148 Substation Drive, Harrisburg, OR 97446. On Sunday I was talking with Konrad and Shannon, who are expecting their fourth child. Already, Konrad said, they are getting the standard-issue comments: "Haven't you figured out what causes this? How many are you going to have?" plus all the hostile looks and attitudes. Now, Konrad and Shannon are among the most dedicated, responsible, fun parents I have ever seen. And their kids are the kind that make you say awwwww because they are just so cute. If anyone should have a big family, they should. Plus Shannon has low-maintenance pregnancies. So it makes me sad to think of anyone disparaging them about having more children. Then yesterday Emily was telling me about the featured weblog on Xanga. "I know you would have cried if you'd read it," she said. In essence, it was a woman telling of how she was young and pregnant, with high hopes of her boyfriend going through this tough time with her, and being a family, etc. Then one day he told her he had made a doctor appointment for her, and she felt so cared-for. He took her over to the "doctor," dropped her off, and left. And of course it was an abortion clinic, and she was too shell-shocked to protest, and her little girl was taken from her body, and now she gets to live with this every day of her life. Obviously, this girl was exploited for the selfish purposes of others from the beginning of her story to the end, but that is a post for another day. Meanwhile, this situation has a connection with Konrad and Shannon's. Somehow, as a culture and even a church, we have become oblivious to the value of children. "If I'm going to have children, I want to have a lot. Big families are just so much more interesting. Plus, I want their children to have cousins."